Killer Characters: When is an award more than an award? When it's a murder weapon! When is an award more than an award? When it's a murder weapon! I was perusing the books on Biddle’s shelf when he returned. He took a candy bar from his pocket and put it on the desk, then removed his suit jacket and carefully draped it over the back of his chair. He was a short, stocky man with a thick neck, large chest, and muscular arms that were evident beneath his shirtsleeves. He wore a starched pale yellow shirt with a purple tie and suspenders to match. He was a fussy dresser, if not one I would describe as particularly stylish. “I’ll say this for her,” he said, “she aced the alcohol and drug screenings. Clean as a whistle. Hasn’t seen the shrink yet, though. We put in for it, but the guy’s so busy he can’t do her until tomorrow. That’s what happens when you have all these whackos on the streets. We arrest one hundred and forty people a day in this city. Hard to keep up.” He ran a hand over his bald spot, a circle of pink scalp peeking out from beneath brindle-colored wavy hair. “And the charge against Cyndi is murder?” I asked. 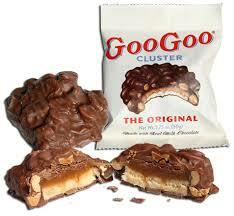 “It’s a Goo Goo Cluster,” he said, eyeing me. “She was obviously frightened and not thinking clearly at that moment,” I offered. 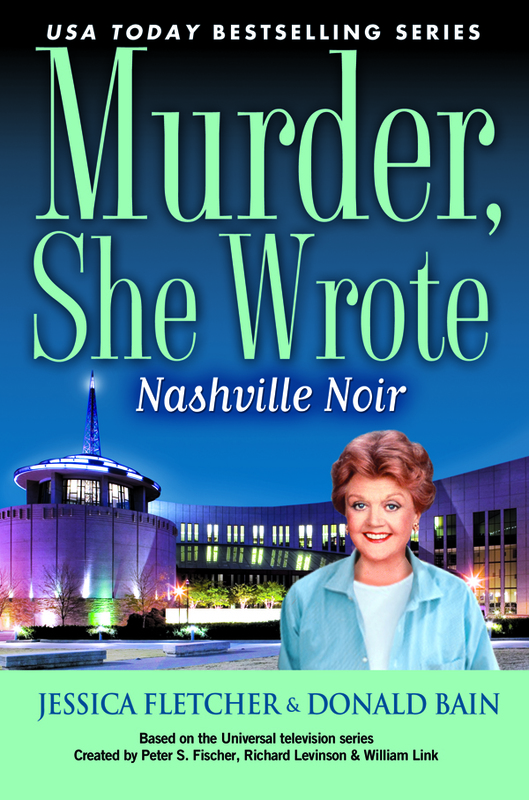 Nashville Noir is number 33 in the "Murder, She Wrote" series. All the books are original mysteries, and are not based on any of the television episodes. Our good friend and award-winning country music composer David A. Stewart wrote a wonderful song called Nashville Noir. You can listen to it here and leave a comment below. We'll do a random drawing for a paperback of the book and a CD of the song. Don's first love is jazz but we both love a good country song. What's your favorite kind of music? It depends on my mood... I like Rock, New Age, POP, etc. Sorry, but country music is not one of my favorites. But I do like jazz! Country music is my favorite! Thanks for the opportunity! Rock and Roll for me! I like everything but rap/hip hop. Thanks for the chance! Aaahh, another Jessica book ;-). I am a rock-n-roll kid of the 60's so always gravitate back to that, but I do love jazz and the old Cole Porter songs. My husband has converted me to a sometimes fan of country. Plus there are always show tunes and the classical music. I guess pretty much everything except opera and rap. Thanks for the giveaway. Hello Nicole! You are the winner of our random drawing for a copy of Nashville Noir, the book and the song. We'll email you for your snail mail address. Congratulations! I read this one a couple of years ago. Love them all. I like just about any kind of music that is done well. Nashville Noir was just my cup of tea---I like those minor chords. Thanks for the contest. We have to say we never appreciated country music until we went to Nashville. The talented musicians in all the clubs just win you over with their creativity and joy in performing. We especially love the fiddle music and it adds a great deal to the "Nashville Noir" song we posted. This is a great introduction to the story. And country, what could be better? I love rock, pop, country - just about anything not too heavy. Nashville Noir looks wonderful! I love all kinds of music from Big Bands to country to light classic. Thanks for a chance to win. I LOVE Jessica Fletcher. She's very classy and stronger than steel. I've not been able to read any of the books to date, but was a devoted follower of the TV series. I don't have a favorite kind of music. I like whatever sounds good whether it's pop, rock, R&B, classical, etc. I love the Murder She Wrote series!! I'm a lover of classical music. Mozart moves me. Nicole just won our random drawing for the book and song of Nashville Noir. Congratulations, Nicole! Thank you all for participating. 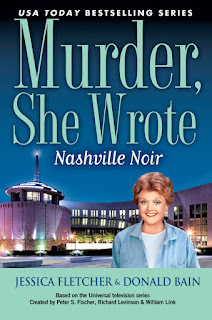 And we'll do it again next month for another "Murder, She Wrote" book on Killer Characters. Hope you'll check out all the wonderful authors on this site.